the klippan in a navestad slipcover how crafty cute is that?! This is awesome! I love everything about it! 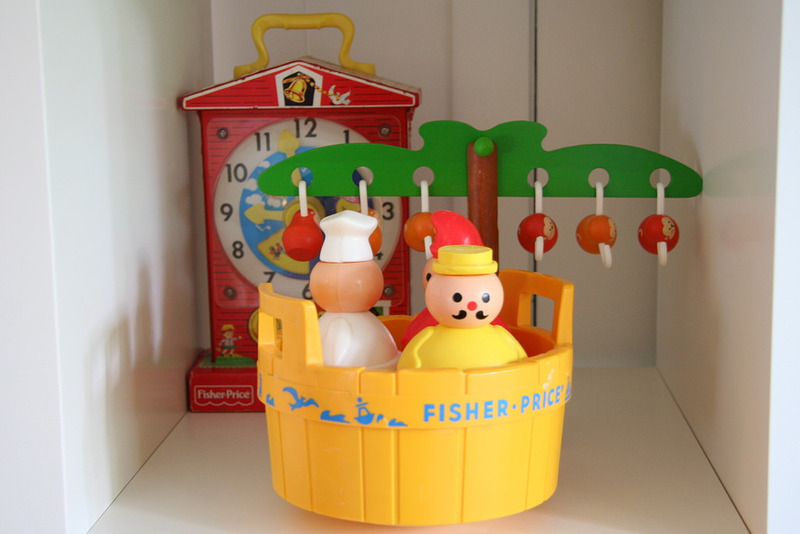 Especially the colors and all the vintage fisher-price! Yes…I do love this room. It’s lovely! Oh, all the old Fisher Price stuff just makes me HAPPY! I spent so many happy hours as a child playing with the school, the farm, the yellow house…and all the Little People were made of wood, LOL. The colors of the pieces really pop out in the white room, it all looks wonderful and enticing! I love that couch! My husband wouldn’t let me get it for our family room, he couldn’t handle the crafty coolness. Oooh, I’m jealous of your FP collection. We have the men in the tub and I love it, but I’ve let my kids play with most of the little people sets we have and they ripped the steeple off of the school. Tragic! Your room looks amazing, though. What a lovely spot – it looks so sunny and cosy. Well done! Wow! It’s perfect! Love the Golden Books. I have a bunch of blank Golden books that I am hording until I find the perfect use. Golden book back and foil spine, totally blank inside and front cover! Love what you’ve done. That slipcover is insane. I’m loving it. 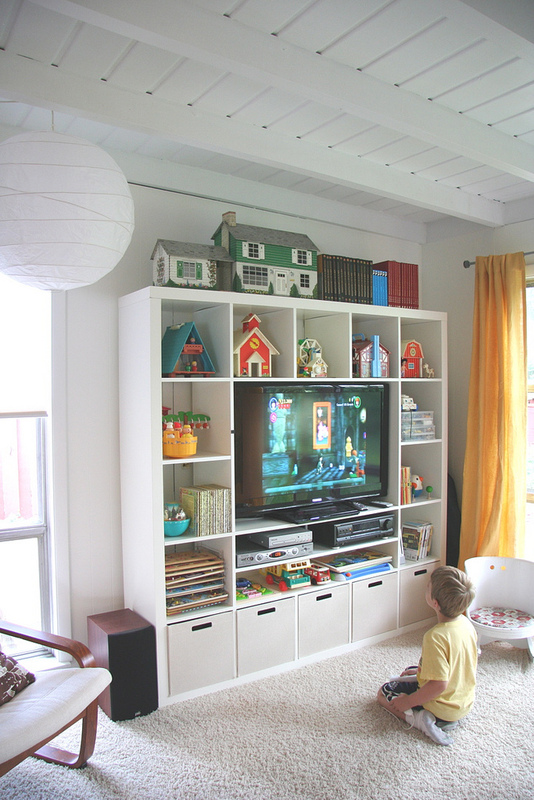 Also the vintage fisher price plus the Ikea entertainment center is SO cute. drooling over the vintage FP. we bought the repro clock for the little… sigh. i wish i still had the barn from my childhood…. I love your art cart idea, I can’t believe I didn’t think of that sooner (craft stuff is all over the house, dare I say even locked in cabinets-shame on me). You’re such an inspiration. I think this could my perfect room! So bright and beautiful – I am so envious (in a nice way of course)! Am loving the fisher price! I love your toy collection. I have some of the same pieces and always feel a tiny bit bad letting the kids play with them. But, they’re toys right?! Oh I live in Sweden (Stockholm) but didn’t know that IKEA had this slipcover. Now I will run to IKEA to look at it! I L-O-V-E this room! 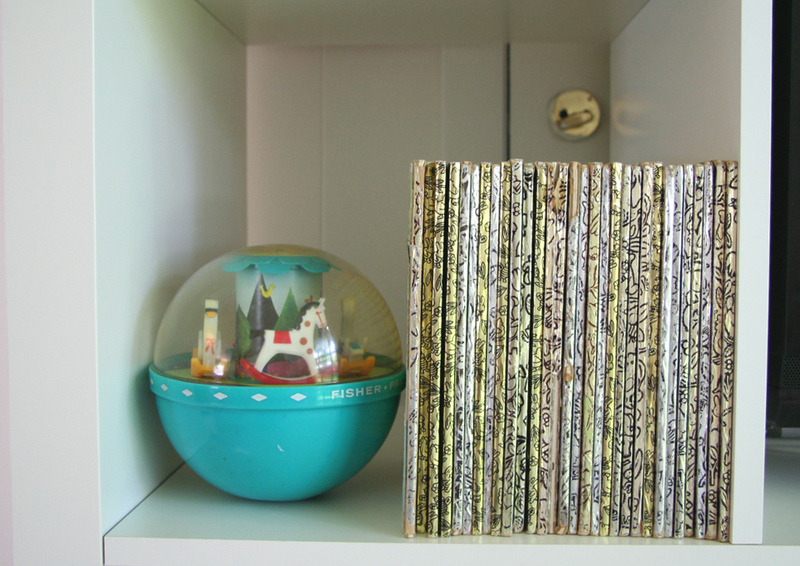 I *heart* vintage Fisher Price toys and Little Golden Books!!!!!!! You have inspired me to show off my Little People and their abodes more. Is that doll house on top of the tv center metal? It reminds me of one I had as a child. It would be from about 1964-1965 ish time period. Very cool! eek. this is all so scrumptious. itso bins from target. they’re a tight fit but they’re working out great. they can get in them but rarely pull them all the way out which makes less mess. no dumping. what? 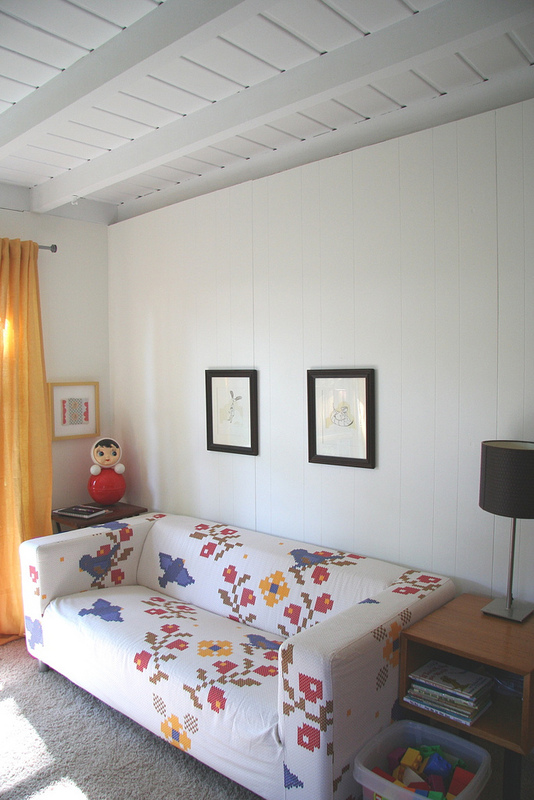 ikea AND vintage fisher price in one photo? I’m in love! awesome. love this but my husband is not buying into the expedit because he can’t fit his record player on there so it will open. curious – do you remember when putting it together if it would be doable to not add in one of the more narrow shelves under the tv?